Part of MAGES' multimedia "Idol Jihen" project. 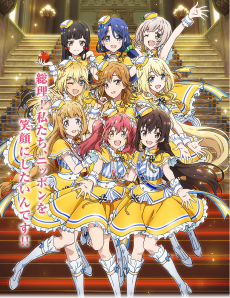 The anime takes place in a parallel-world Japan, where idols stand up against a corrupt government as "idol Diet members," and then work to bring back the smiles of the Japanese people through song and dance. The idol Diet members belong to seven different political parties, including the Heroine Party, the SOS Party, the Subculture New Party, the Bishōjo Party, the Wakaba Party, the Starlight Party, and the Sanrai Party. Episode 1 - Why Become a Dietwoman? An offensively bad attempt at cashing in on idol anime.